Paired with pops of colour, white wedding lehengas are no longer avoided. Brides no longer want to wear super-heavy outfits that are difficult to even walk in. It’s all about minimalism and comfort. We all know that cold-shoulder/cut-out sleeves are trending in western wear. But guess what, our wedding lehengas have caught up too! 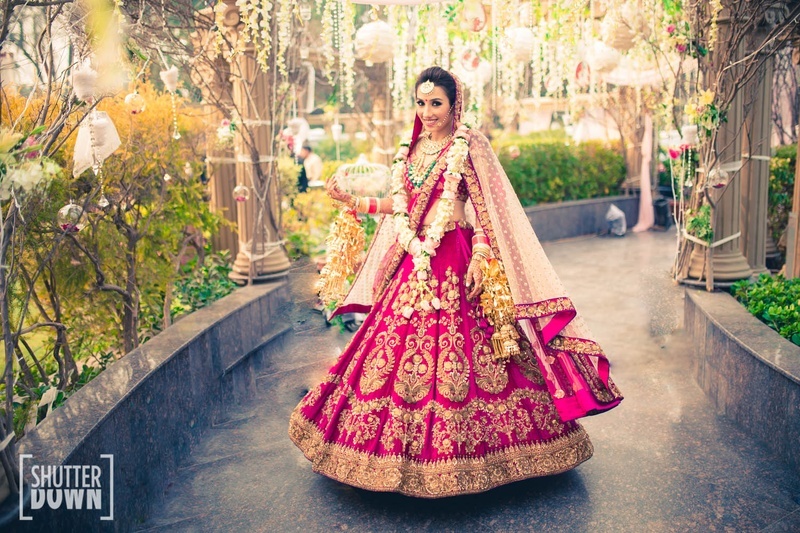 Glittering gold lehengas are replacing the customary red colours of an Indian bridal outfit. Heavily adorned dupattas are gone-gone-gone! Sheer dupattas are everywhere. Pair your bridal lehenga with light, see-through dupattas of a toned down, muted shade of the lehenga-colour. Light embroideries and borders on the dupatta work brilliantly! Velvet fabric makes a comeback in deep tones. We’ve seen a few brides customise their wedding lehengas by weaving couple names or their love story onto the fabric. How creative is this! It’s not always about zardozi work! More and more brides are going for printed rather than fully embroidered ones. They are much lighter, easier to carry and also have fun motifs! Ideal for your mehndi day. Bridal wear with western touches – modern lehenga gowns are great options for a Sangeet night. Indian bridal lehengas with modern touches and quirky, whimsical elements. Mix-n-match works great with these!